Brown the beef cubes in a pot heated high, remove and set aside. In the same pot fry the onions, carrots and celery until soft. Add the garlic and mushrooms and continue to cook for another 5 minutes. Add the bay leaves and herbs into the pot and return the beef and pour over the beef stock. Bring to the boil and then reduce to a simmer for 1- 1½hr until meat is soft and tender. Mix the cornflour and water, turn up the heat and add the mixture to the pot. Allow the sauce to bubble and thicken. Once the sauce is thick, turn off the heat and set aside. Preheat the oven to 200’c. Cut the pastry sheets into 3 circles and large enough to fit the 6 heatproof dishes you have chosen to use. 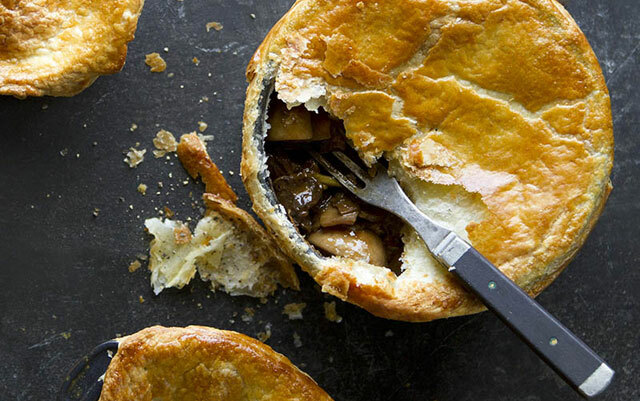 Fill the dishes with the beef and mushroom filling. Brush the outside edges of the dishes with egg and place the pastry on the rim of the dish and press to seal. Brush the top of the pastry with egg, cut 2 holes in the pastry to allow the steam to escape. Place in the oven and bake until golden, roughly 15-20 minutes.